So that was the fastest gearing up I've ever done in an MMO. After hitting 50 on my powertech, I kinda lost my enchantment with the character. So I rerolled to a sorcerer. Crafters can make tradeable 126-rating gear for every slot but the relics and weapons. Prices vary by server, but on mine, these items tend to run around 40k/slot for armor, 15k per implant, and 15-20k for an earpiece. The cost of crafting these items is even smaller, so check around in guild for who can make the pieces. I lucked out and found a few guildies with the patterns I needed, and so spent about 150k on gear and got 126-rating items in every non-weapon slot. Daily quests are amazing - I was a fool for skipping them on my first character. 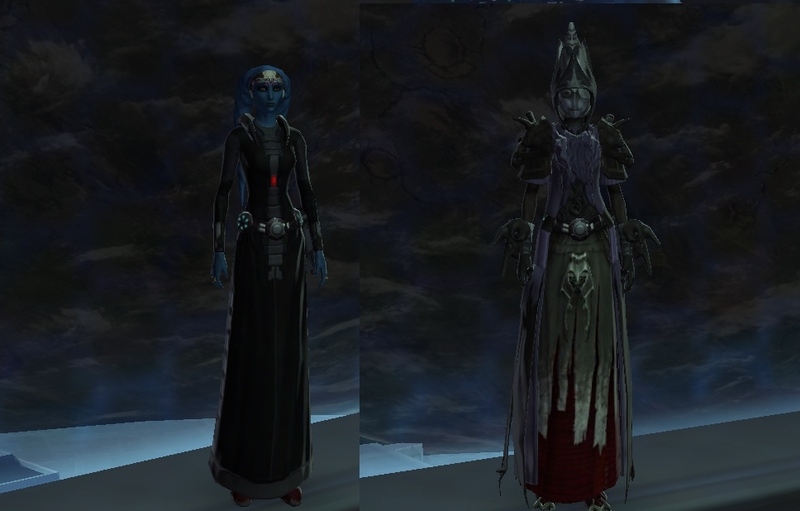 After finishing the story quest, I went to Ilum and Belsavis. In total, the dailies give about 120k credits each day, and 25 daily commendations. Just doing the heroic dailies gives an orange weapon for the companion, and a 124-rating armor, mod, and enhancement (just from heroics, each day, you can mod an item to 124-quality). . So just 2 days of dailies is enough to mod 2 items, gain an orange weapon for two companions, and more than afford a full set of 126-epics off the galactic market. I chose to save the daily commendations - they are the way to the best implants and earpieces (120 commendations each). I did a round of the pvp dailes and weeklies, starting with some Ilum. Yes, I got stomped by Battlemasters with the manners of rabid dogs. But.. the weeklies give 6 Champion bags between them, and the dailies each give one. Each bag gives 15 Centurion and 7 Champion Marks. From 12 weekly/daily bags and 6 bags I'd saved while leveling, I had enough marks to purchase a centurion mh, oh, 3 set centurion gear, and 1 piece of champion gear. It took me three days to get my sorc ready to run ops at level 50. Three. SWTOR has a wonderful design philosophy: easy to get raid ready, but each tier of gear beyond that is progressively harder to get. Great for re-rolling. Great for recruiting new members.